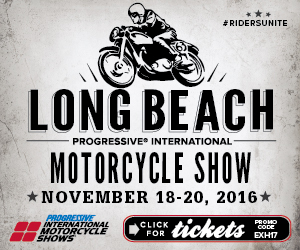 The Progressive® International Motorcycle Shows® (IMS), the motorsports industry's most powerful method for engaging qualified buyers, will have an increased commitment and support from leading motorcycle aftermarket brands for its 2017 tour. Michael Ausec, Director of Sales, Progressive® International Motorcycle Shows®: "We are excited about the increased support from aftermarket brands for the 2017 IMS tour. As an enthusiast myself these brands are a critical attraction and will surely enhance the attendee experience across the tour with new opportunities to touch, test, be educated, and now buy the latest motorcycle gear and aftermarket accessories." This year, Marketplace brands have the opportunity to bring the retail cycle full circle by closing sales on the show floor at The Marketplace Online Shop display. The 15' garage themed display features a customized motorcycle lift, provided by Titan Lifts, outfitted with iPads that will act as a central feature in The Marketplace and allow buyers to purchase products online from participating brands. Erik Stephens, Founder & CEO, Twisted Throttle: "The IMS Marketplace provides a great forum for us to connect with riders and dealers in the motorcycle industry. There's no other venue in the USA where riders can see, touch and feel so many of the latest bikes, accessories and gear in so many cities. It's been a benefit to both our customers and our product development staff to connect and share experiences via the IMS Marketplace. The IMS Marketplace will provide riders with an abundance of ideas for the hottest motorcycle upgrades and the best motorcycle mods in the industry today.